Today is National Girl Scout Cookie Day!! Did you know that Girl Scout cookies have been around since 1917? The first cookies were the idea of the Mistletoe Troop in Muskogee, Oklahoma, who baked the cookies as a fundraiser. 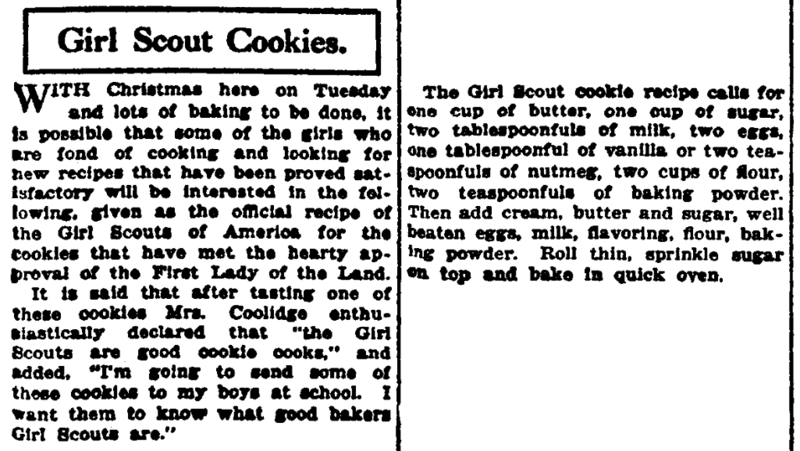 In 1922 a Girl Scout cookie recipe printed in their official magazine provided all troops the recipe and idea to bake and sell cookies to earn the funds they needed for activities. By 1937, cookie selling would become so popular that 125 Girl Scout Councils were making and selling cookies; a year later bakers started producing the cookies, making it easier for the girls (and their mothers). After World War II, 29 licensed bakers were producing three varieties of Girl Scout cookies. (1) Today, Girl Scout cookies are made by two licensed bakeries, rather than numerous bakeries nationwide or the scout troops themselves. 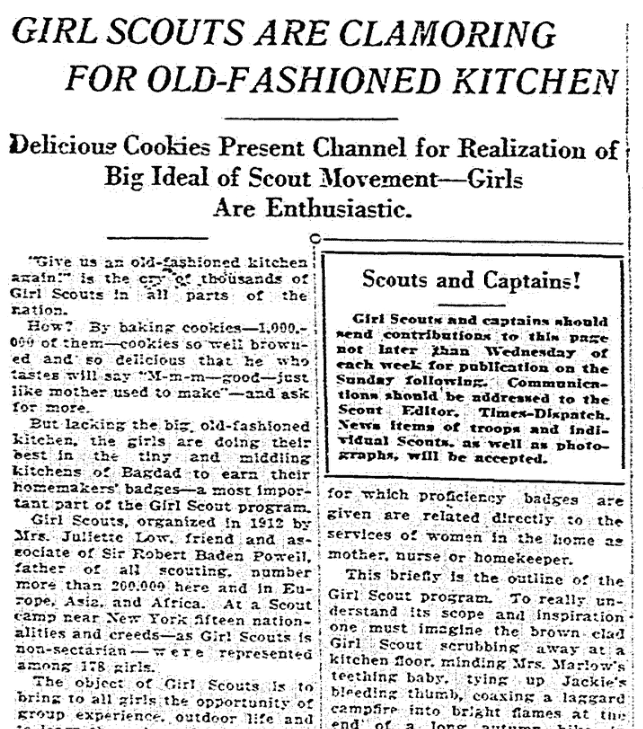 Articles about Girl Scouts and their activities can be found throughout GenealogyBank’s Historical Newspaper Archives, especially in small town newspapers. But it might come as a surprise to you to find out that Girl Scout cookie and dessert recipes can also be found in old newspapers. Today there are 12 varieties of Girl Scout cookies, including two varieties that are gluten free, but at the very beginning of Girl Scout cookie history there was only one cookie. 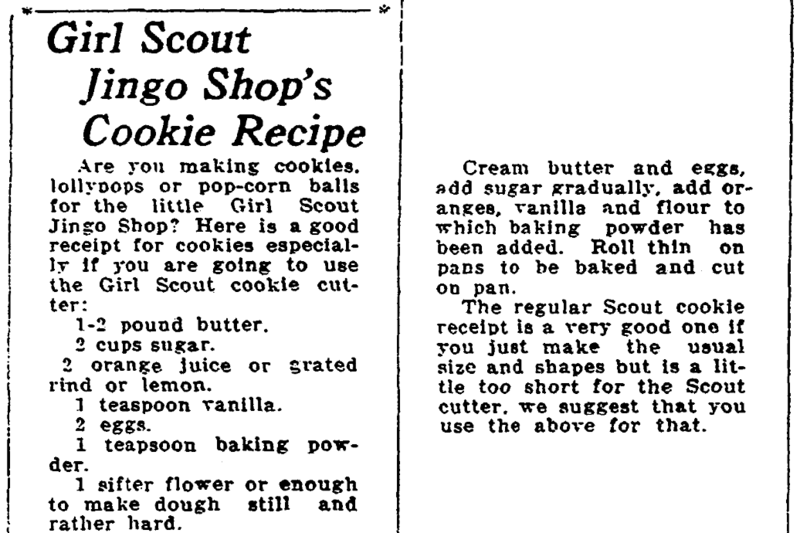 (2) There was even an official Girl Scout cookie cutter you could use, as this 1926 recipe mentions. Sure, it’s great to just eat Girl Scout cookies straight from the box – but they can also be used as ingredients in other recipes. I suggest buying a box of Thanks- A-Lot cookies (a shortbread cookie with a fudge coating on one side) to take to your next campfire. Take two Thanks-A-Lot cookies, add a toasted marshmallow, and you have smores! If you search the Internet you will find all kinds of recipes for using Girl Scout cookies in desserts, but this isn’t a new idea. 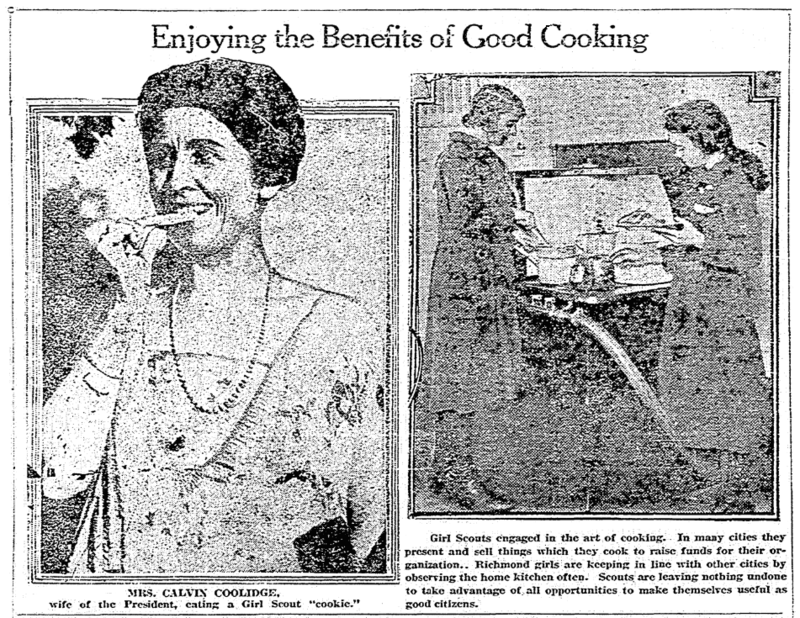 Old newspapers show that recipes using Girl Scout cookies have been around for almost as long as the cookies themselves. Perusing these recipes provides some great ideas to help you use up your box of cookies. 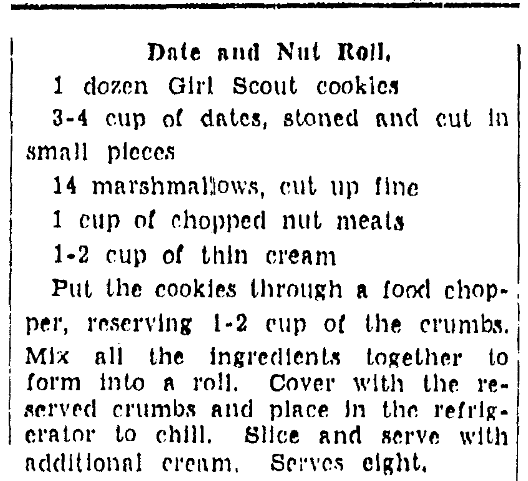 Here are two 1939 newspaper recipes that use the cookies as an ingredient for a Date Nut Roll and a Cookie Crust. This refrigerator pie dessert uses crushed Girl Scout cookies as a pie crust. 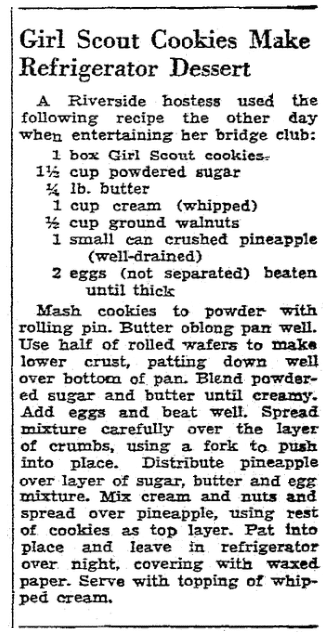 This 1959 recipe includes a cookie that is a favorite of everyone I know: the Thin Mint. 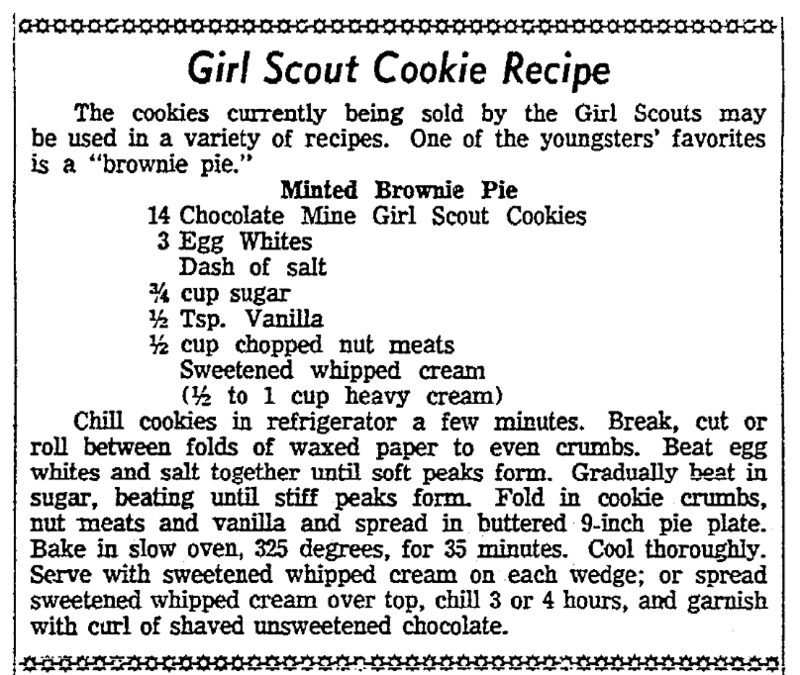 One of three flavors sold in 1951, the Chocolate Mint, now known as the Thin Mint, makes part of this Minted Brownie Pie dessert (note that the there is an error in the article, calling it Chocolate Mine cookies). In my opinion, the problem with Thin Mints is making sure you buy enough. If you did buy a few too many boxes (or cases) you could consider using them to make ice cream. And who could resist using a box or two of Thin Mints to make their own Cookie Mint Ice Cream? 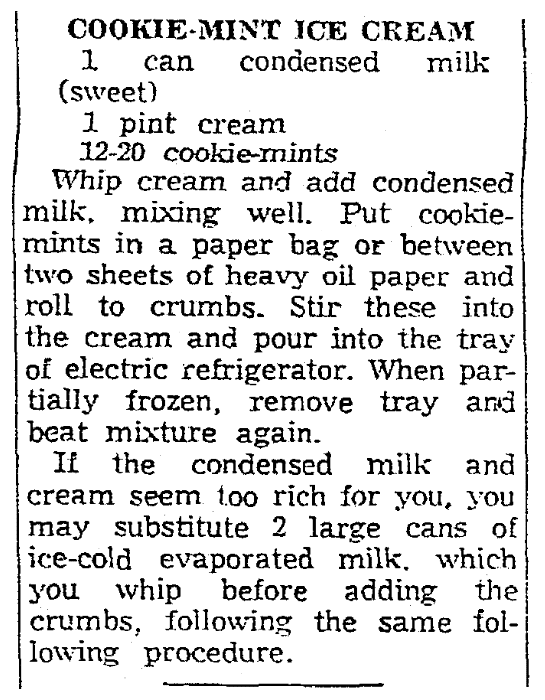 This 1962 recipe is simple, only requiring cream, condensed milk, and cookies. If you want to try your hand at some desserts using Girl Scout Cookies as an ingredient, look no further than the Girl Scout website, which includes recipes to use for the cookies they sell. These recipes run the gamut from cheesecakes, ice cream, bread puddings, and candy. Need to find some Girl Scout cookies? Check out the Girl Scout Find Cookies! page for locations near you. You can also find cookies via the Girl Scout Cookie Facebook page or the free mobile app. (1) “Girl Scout Cookie History,” Girl Scouts (https://www.girlscouts.org/en/cookies/all-about-cookies/Cookie-History.html: accessed 6 January 2019). (2) “Meet the Cookies,” Girl Scouts (https://www.girlscouts.org/en/cookies/all-about-cookies/Meet-the-Cookies.html: accessed 7 January 2019). (3) “Girl Scout Cookie History,” Girl Scouts (https://www.girlscouts.org/en/cookies/all-about-cookies/Cookie-History.html: accessed 6 January 2019). Per my granddaughter’s request for Valentine’s Day, I bought a box of Samoas for her today. Personally, I like other kinds better. Cynthia, personally my favorite are Thin Mints. They are even better if you stick them in the freezer and eat them cold!